Warm up those bone-chillingly cold winter miles with the versatile Sorpasso 2 bib tights that blend a duo of Castelli's top thermal fabrics. Featuring their Thermoflex Core2 fabric for optimal warmth and insulation, and the standard Thermoflex fabric for the perfect balance between stretch and compression, these bib tights fit comfortably and offer more versatility than your traditional tights. Inside, the Progetto X2 Air chamois utilizes multi-density padding to provide optimal support for serious winter riding. While down low, the GIRO3 ankle grippers lay flat over the ankle, allowing the bibtights to form a solid seal around shoecovers. Progetto X2 air specific seat pad for maximum comfort. GIRO3 ankle grippers lie flat and seal around shoecover. YKK® Camlock® ankle zippers with reflective tape for high visibility. 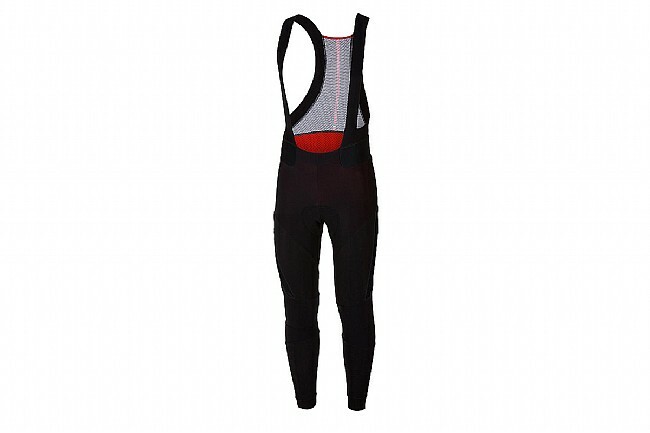 The Sorpasso 2 is an extremely well made bibtight, infinitely comfortable, and keeps me warm without being stifling. For Americans, be sure and size up one.